Farlin TOP-242A Feeding Set (Bowl) is a bowl cutly design for babies with 360 degree-no angle limita..
Little ones will love having their very own plate and bowl featuring their favorite Zoo character! B.. Features: -Includes a plate and a bowl -Signature Skip Hop ZOO characters -Durable melamine -Dis..
Little ones will love having their very own plate and bowl featuring their favourite Skip Hop Zoo ch.. 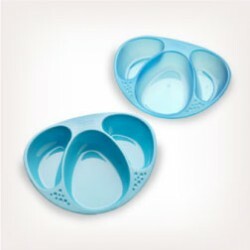 Designed to encourage toddler independence at mealtime, this three-piece plate and bowl set is the p..
Ages 6m+ Three-piece set includes divided toddler plate, translucent toddler bowl, removable traini.. Designed to encourage toddler independence at mealtime, this three-piece plate and bowl set is the.. Need more room in the baby bag for all your on-the-go items? Pack a snack in this collapsible bowl d..
Our Cool and Mash Bowl helps ensure that every spoonful of food has been properly cooled and mashed .. Dish is easy to hold Spoon clips snugly onto the inside of lid for easy storage Convenient size fo.. Description:The bowls are just right size to hold a child's meal. The spoons are designed to fi..
Tommee Tippee Basics Bowls helps your baby to master eating and drinking in small, gradual steps. ..
Ready, set, feed!Feeding baby can be a very messy affair, and sometimes that squeezes out all th..
Stay warm plate 2 in 1: keeps food warm. It has a convenient space to rest the spoon and an area to ..
Stay Warm Plate 2in1 , ideal to start the weaning phase. The Stay Warm Plate 2in1 helps the mother .. Dish Set: these help your child to eat independently, thanks to their non-slip base, a special area ..
Nuby monster flower flat plate for children is very suitable for both hot and cold foods. Suitable f..
About the Product: Bright, fun and durable bowls that are great for your child Strong enough to wi.. Bright, fun and durable Snack Bowls Set that are great for your child Strong enough to withstand th..
Makes feeding fun for baby and easy for you Easy Grip handles are perfectly sized for little ha.. When babies begin to show interest in feeding themselves, having the right equipment is a must! Nuby..
1. 2 x bowls with leak-proof lid and spoon 2. Easy-scoop triangular base 3. Stay-clean spoon cover.. Enjoy feeding your baby with our Soft Tip Weaning Spoons, designed to make the weaning process easie..
Our Section Plates are perfect for family mealtimes: the 3 sections mean you can introduce your todd..
Our Feeding Bowls come in a bumper pack of 4 probably all you’ll ever need for baby and toddler meal.. Plastic Made of durable melamine, the set is perfect for a variety of meals, and the bright colors ..
Make Mealtime Zoo time. Little ones will love having their very own plate and bowl featuring their f..